When we were younger, Isaac always said he wanted six kids. I always said I saw myself with three girls (weird, right?). After we had Grace and Charley, we settled on the idea of having four. We talked about waiting a few years after Charley was born and then having two more, so the first two would be close and the second two would be close. Fast forward a few years and along came Perry. We had to work for her, though. We tried for fourteen months and then had a miscarriage before getting pregnant with that little sassy pants. Since we wanted our fourth baby to be close in age to her, we started trying a few months before she turned two. 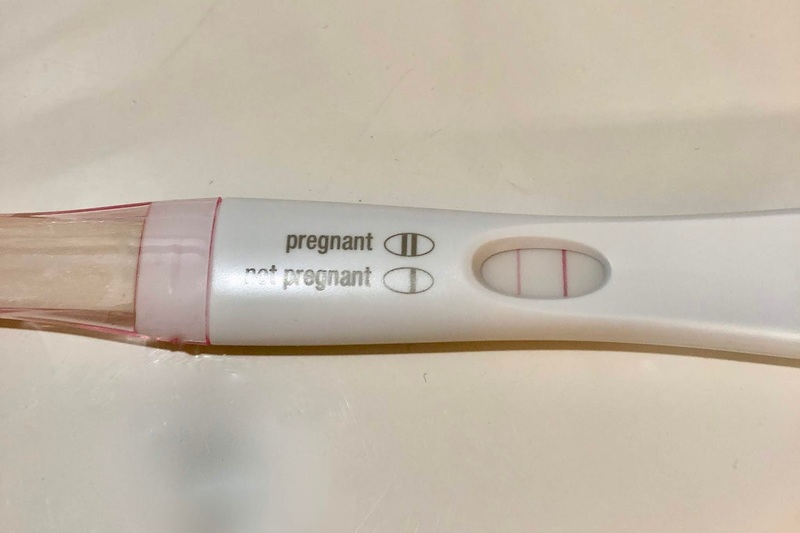 We got pregnant in March only to have another miscarriage. I was pretty numb for a couple of months until it finally hit me one day. We had stopped trying and just had the feeling of "it'll happen if it's meant to". In August, we started the keto diet, and I read that it can throw your cycle off the first couple of months. I had lost fourteen pounds and wasn't really even thinking about getting pregnant at this point. My cycle is always exactly twenty-eight days and is rarely ever off. 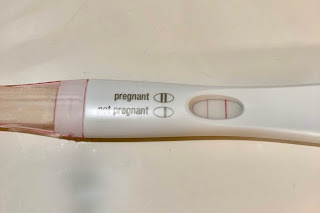 When it didn't start on September 8th like it was supposed to, I was curious if it was due to keto or if I had actually gotten pregnant. I made Isaac stop to grab a test on the way home from the girls' soccer games that afternoon. We started cooking dinner, and I ran to take it really quick to rule that out. To my surprise, it said yes! We were pretty shocked but also pretty excited. I wanted to wait to tell the girls, but of course, Isaac told them right away. They were also excited, but they knew about our losses before. Grace and Charley were anxious to find out if the baby was going to get a heartbeat, but I told them we'd have to wait a few weeks. 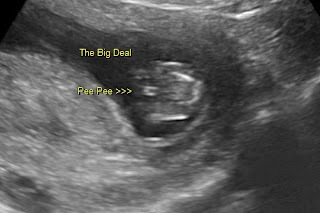 My doctor wanted to see me pretty quickly, so I went in expecting to get a quick ultrasound like I had with my previous pregnancies. The nurse said it was too early and they wouldn't be doing one that day. I was pretty bummed. They also wanted me to go take the 48 hour HCG test to make sure my levels were rising. Due to the prior losses, they thought that would be best before sending me for the full panel. They were supposed to call me with the results, but they never did, which made me a little nervous. At six weeks, the morning sickness hit, and it hit hard. I was having a hard time keeping anything down, so my doctor put me on Reglan. I started on a Friday, and that weekend was awful. It somehow made everything worse, and I didn't leave my bed at all. It felt like I had the flu. I called my doctor Monday, and she switched me to Zofran. Within 48 hours I had so much relief. I was finally able to eat again! I was sick with all of my prior pregnancies, but I started to wonder if this one was worse because I'm in my thirties now. I was also pretty exhausted and spent most evenings watching TV (mainly hockey and football) with my eyes closed in bed. I pretty much stopped blogging at night, because I just didn't have the energy. 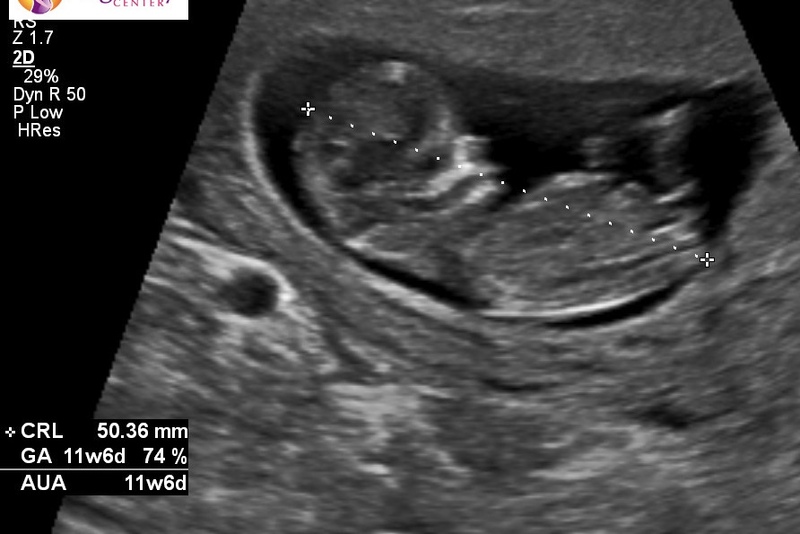 Although I was feeling pretty bad, it made me hopeful that baby was growing and sticking. I finally had an appointment to see the high risk doctor for a detailed ultrasound at eleven weeks, five days. The doctor measured the nuchal fold and the liquid inside to test for down syndrome and other genetic markers. She said that baby looked great and everything was measuring exactly as it should be. Baby also had a strong heartbeat! Hallelujah! The doctor also gave me some risks due to my prior cesareans. She mentioned placenta previa, placenta accreta, and told me that I should talk to my OB to see if she took any notes about my uterus looking thinner during my last cesarean. She said that it thins out with each baby and that my risks could be higher if it was really thin. I told her that I asked my OB on the operating table after my last cesarean if everything looked OK for me to have one more. She thought I was nuts but said that it looked great. That gave me a little piece of mind, but it also left me pretty terrified. 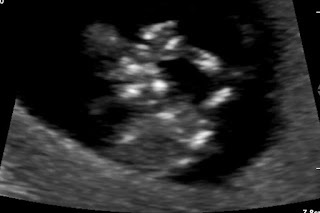 While we were there, we asked the ultrasound tech about the gender, and she said that she thought it looked "girlish". I asked the doctor when she came in, but she said it was too soon and was a 50/50 guess. We kind of settled on the baby being a girl, and Isaac even decided that he wants to name her Cora. I'm not sold on it, but I added it to our list (currently Clara, Rose, Caroline). He told the girls we thought it was a sister, and they were a little disappointed. Grace really wanted a baby brother for once. 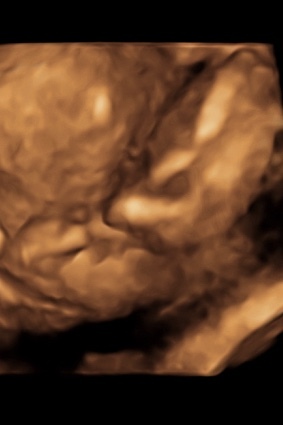 We showed them these pictures of baby waving "hello" and hanging out in mom's belly. The high risk doctor also sent me for some more specialized blood work to screen for other types of genetic markers. The following week, I had an appointment with my regular doctor, and she said the HCG levels looked OK and that I should go for the full panel. I did my third blood draw, and they took a million tubes this time. Luckily, this part never bothers me too much. After two weeks, I'm still a little nervous about the placenta risks, but I'm trying not to stress about it since there's nothing I can do either way. The doctor said we'd keep an eye on it, and I go back just after Christmas for another ultrasound. We've now reached thirteen weeks, four days pregnant. We're in the second trimester and moving right along. 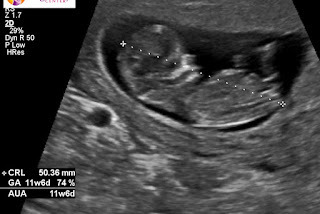 Isaac and I are both certain this baby is a girl, but my sister Allison talked me into doing a quick ultrasound on my lunch break to verify the gender anyways. We were just going to wait until the appointment after Christmas to make sure. We got to the ultrasound place, and I started to get a little nervous. I always feel this way before we get to see the baby and settle down as soon as I see the heartbeat. The tech couldn't believe we had three girls. She grabbed a pink glove and then switched to a blue one for Isaac's sake. She broke two, but the third one finally went on. Things didn't look good for him. 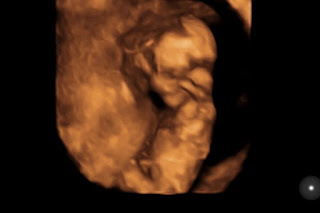 After seeing the heartbeat, we peeked in on the baby's face. This little nugget was snuggled up tight in there with it's legs crossed. 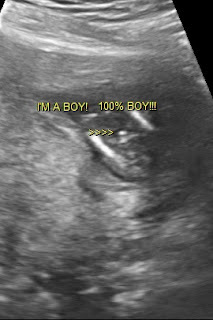 This picture is hard to decipher, but when we started checking for the gender, baby put it's hand over it's gender area. The top right is the baby's shoulder, and it's arm goes down across it's body to hide it. What a little stinker already! Finally, after what seemed like forever. The tech said she was 100% positive and finally got a good picture to show us. Like, I can't even believe I'm typing this. We were all in shock. Everyone's mouths just dropped. Isaac is obviously over the moon, and I'm still in shock. What am I going to do with a boy? It's like we're starting all over with our first baby again. We also got a phone call right after from the high risk doctor saying that our blood results were in, and everything looked perfect! We're so excited! Baby will be named Isaac Allen Espejo IV. After three girls, Isaac finally got his boy. The girls are torn on what they think. Char mentioned that we should name him Robbie instead of Isaac. I told her there was a whole line of Isaacs, and she said, "well how come there aren't a whole lot of Charleys in our family?". Having a baby brother will have to grow on her. I made sure to get a video of the girls' reaction. We can't wait to meet the littlest (and last) Espejo! !